The word “opal” comes from the Latin word “opalus” which means “ to see a change in colour”. Opal is made up of millions of tiny uniform spheres of transparent hard silica (sand), which fit together in an orderly three-dimensional frame, sitting in a bath of silica solution. Light passes through the transparent spheres in a direct line, but when it “hits” the bath of silica, it is bent and deflected at different angles; this is what produces all the different colours. Black opal is characterised by a dark body tone causing brightness of colour which is unmatched by lighter opals. It is mined in Lightning Ridge, New South Wales and is the most valuable and sought after type of opal. The term “black opal” does not mean that the stone is completely black but that the stone has a dark body tone ranging from dark grey to jet black. This type of opal features light white body tones, and is mined in South Australia. White opal is more common and because of its body tone does not show the colour as well as black opal. 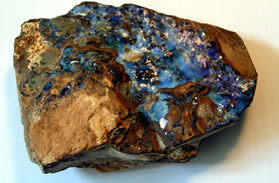 Nevertheless white opals can still be absolutely magnificent in colour if a good quality stone is found. 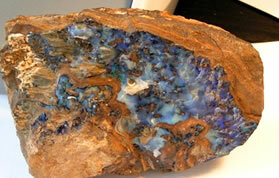 This stone forms on ironstone boulders in Queensland The opal is cut with the ironstone left on the back. This stone is the second most valuable type of Australian opal after Black Opal. Solid opals are fine in water and should be cleaned gently in a mild solution of detergent in warm water and a soft toothbrush or cloth. Avoid bleach, chemicals or cleaners. Because doublets and triplets consist of layers, which are glued together, prolonged exposure to water will cause lifting between the layers and allow water to penetrate. If this happens the stone will take on a “grey” or “foggy” appearance. You should avoid getting a doublet wet. Doublets and triplets may be cleaned by wiping over with damp, soft cloth and mild detergent but should NEVER be soaked or immersed. This comes from South Australia. 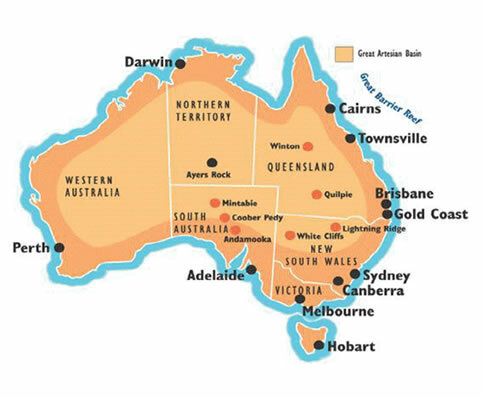 The three main fields are marked on the map and the busiest one in production is Coober Pedy. This comes from Queensland and the two main working fields are marked on the map. The main field is Quilpie. This comes from New South Wales and the most productive field is Lightning Ridge.